It’s July 29th in the Outdoor Gardens of our world famous Phipps Conservatory. In the middle of Pittsburgh, within view of Carnegie Mellon University and the University of Pittsburgh, our Strymon Melinus has spent the night, comfortably nestled nearby, asleep. Now it’s morning and time to eat! So, like most Pittsburghers, the butterfly’s shopping is done nearby, in the neighborhood. This isn’t just any butterfly haven. The Outdoor Gardens at Phipps are closely managed. Each year they offer abundant, healthy perrenials and annuals for the enjoyment of their visitors as well as for the nourishment of the fauna who flourish there. This female is doing just that. The butterfly pictured here is actively feeding for the carbs, proteins and other nutrients available in the nectar, at the base of the flower. In the northeastern Unite States, Gray hairstreaks fly from late April through September, if not longer. Grays, and other hairsteaks, fly short distances, close to the ground, and usually are solitary. As noted in our earlier posts, spotting one is a Treat! 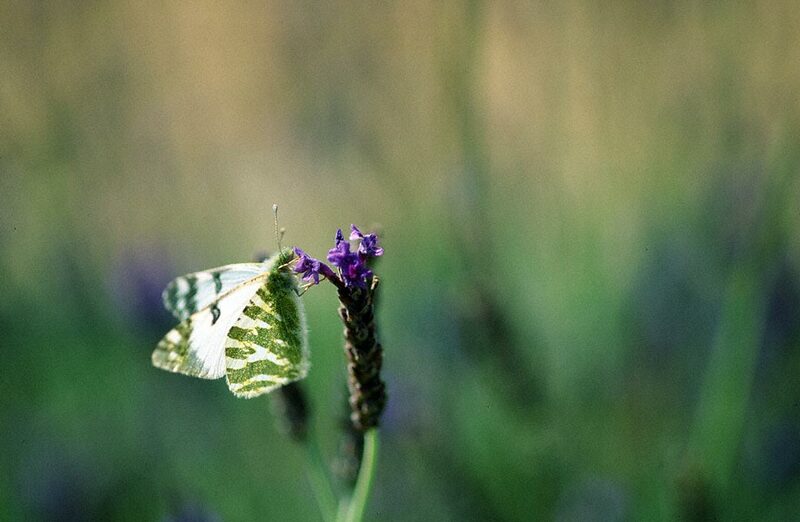 I photographed a Green-Striped White Butterfly while working a wildlife refuge trail in northernmost Golan. 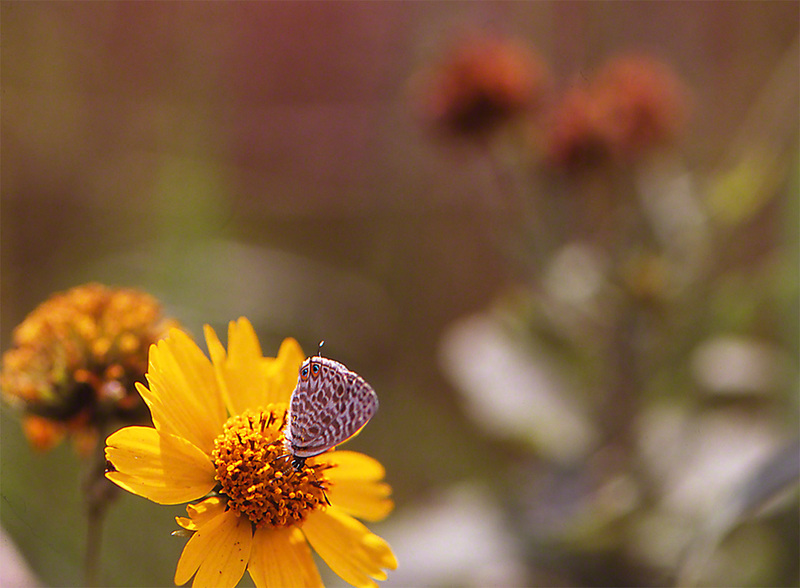 Of course, photographing butterflies is not work. It’s exhilarating and it’s suspenseful. I have never been here before, and who knows what butterfly will fly in next? This fun is well known to those of us who pursue butterflies, birds, reptiles, uncharted wilderness, and an infinite number of other new experiences. Euchloe Belemia Belemia is yet another Israeli speedster. Hurtling and zooming up the trail, the butterfly zipped from flower to flower, gauging the nectar reservoir of each new flower. During my upcoming visit to Israel I will acquire a comprehensive wildflower field guide. Then I will no longer shy away from identifying those Middle Eastern blooms. Found throughout Israel, this one was seen on March 19th, and of course, within moments, it was gone! gone! gone! The butterflies of Israel; they are speedsters! Our second post of the view from the very peak of Mt. Hermon. Exhilirating for me! Routine for the cow? Our upcoming trip back to the top of the mountain remains a Go! Guarantees? We know that there aren’t any. As of the date of this post, this remains one of the world’s situational hot spots. I went with a guide in June 2008, and I will never forget that field work. Mt. Hermon has been known to offer as many as 40 species of butterflies that are not found anywhere else in Israel. Are they found in Syria? Well, look again at this beautiful image. That’s Syria down there. The geography you see is currently a battleground and an inhospitable graveyard, with men and families fleeing for their lives. So, we’ll not know anytime soon what butterflies are flying down there. I certainly won’t ever enjoy that outing. Mt. 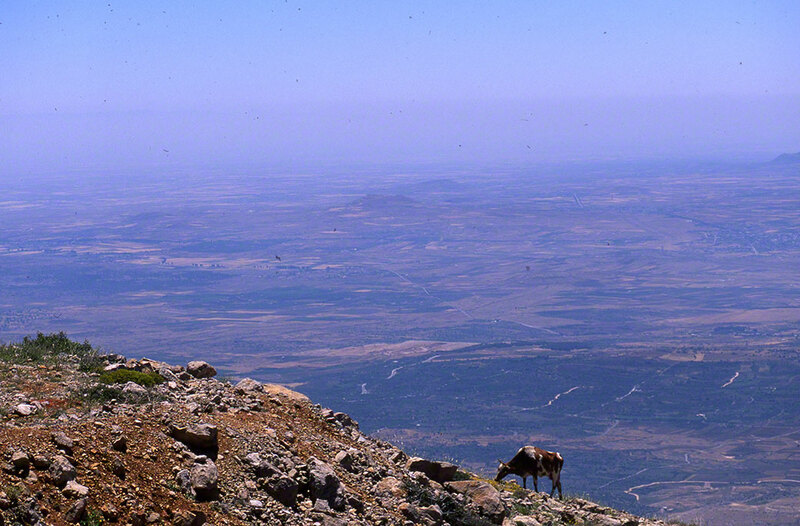 Hermon also faces Lebanon. There too that side of the mountain shall forever, for us, keep its butterflies a mystery. I go there very appreciative of the opportunity, praying that it remains one. I also remember, and posted before, that the butterflies on Mt. Hermon are virtually unapproachable. How will that be after they hear the daily Booms! and KaBooms! of man’s craziness below? Do remember to keep in touch and revisit. Who knows what magical views we’ll share. Funny how things are. 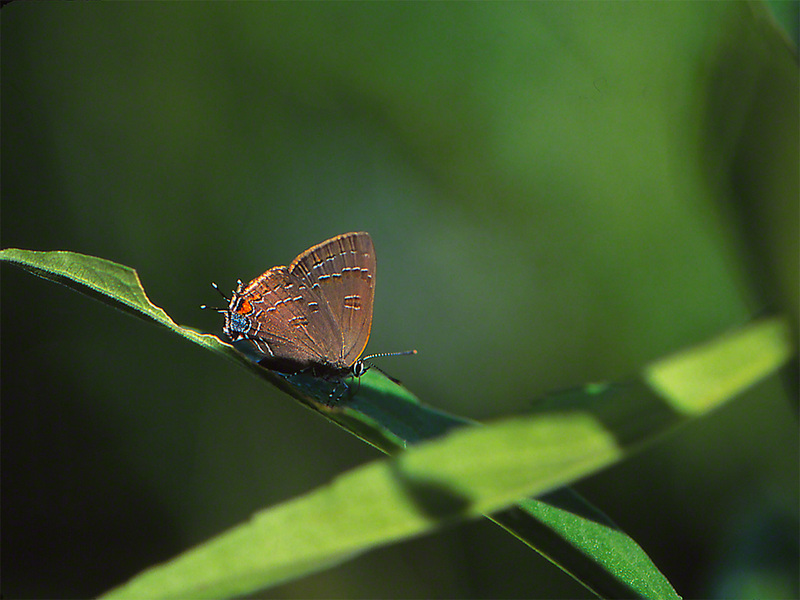 A really good field guide cites Satyrium Calanus as the most common and widespread of hairstreak species. In this particular field guide, the accompanying map key shows that western Pennsylvania is squarely in this butterfly’s primary range (Cech and Tudor, Butterflies of the East Coast, Princeton University Press). Still, I’ve only seen and photographed 3 of them in the last 13 years. We can consider that Satyrium Calanus much prefer to be well off the ground in oaks, walnut and hickory trees. This behavior explains in part why we’ve rarely seen them. It’s reported that they do eat nectar, especially from asclepias (milkweeds) and dogbane. We’ve not seen that. I did find this beautiful specimen on a June 23 morning in Raccoon Creek State Park in Southwestern Pennsylvania, luxuriating in the morning sun, thankfully not too high over the trail. This is another butterfly that prefers the forest’s edge. With its 2 pairs of hindwing tails, and one pair much shorter than the other, this butterfly is certainly not a Hickory hairstreak (Satyrium Caryaevorum). It helps if you’re an esthete. The outer forewings and hindwings deliver this yummy palette of rich, brownish, tanned leather, rich sky blue and reddish-orange splash. I love that concentration of strong, warm color. But that’s me. This is probably a male. They venture out more readily and probably bask more often. Females, are perhaps camera shy? 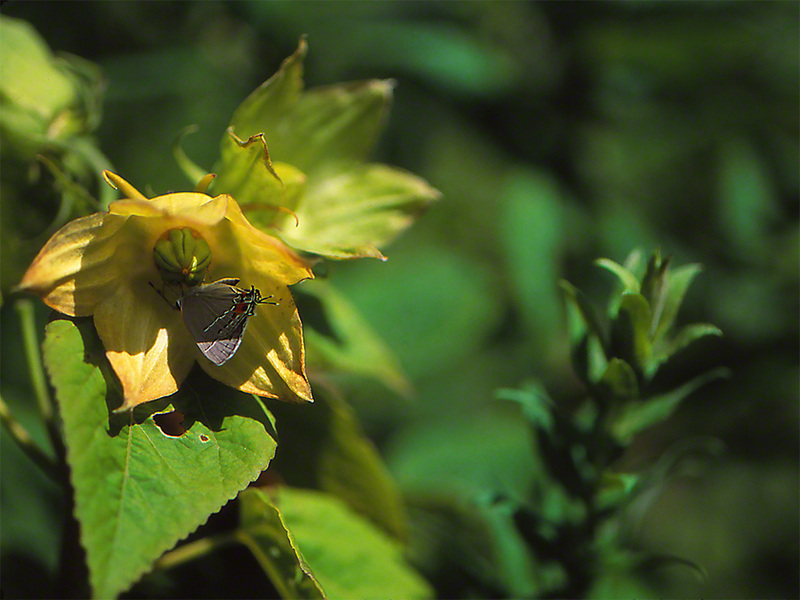 This is our second Banded hairstreak photograph. It’s not a bad one, having seen so few of them. Photographing this butterfly was another Birthday present for Jeffrey. It’s November 27th, one day before my Birthday (B- because I love birthdays) and the farm roads surrounding Binyamina, Israel provide another gift for the Birthday boy! And it’s Lang’s Short-Tailed blue Butterfly, or more properly, Leptotes pirithous. This male flew in from the tree breaks along the dormant fields and went straight for just about the only butterfly food trough around, Camphor weed. One of several species of Blues in Israel, Egypt, Jordan and Lebanon, Leptotes Pirithous are a delight as they fly in to feed. They graze flowers with singular purpose. When your approach with a camera is skillfully made, Lang’s Butterflies are quite tolerant and even cooperative. A little more head to the left please! and there he goes, pleasing you to no end. He’s a classic pookie! On May I fly to Israel. My to-do list is topped by photographing on Mt. Hermon and seeking excellent photos of the Two-Tailed Pasha in the North. Any help you might offer with the Pasha, would be very appreciated.